Alford farmer Charlie Adam was yesterday elected a vice-president of NFU Scotland. Mr Adam, from Braeside Farm, Leochel Cushnie, was chairman of the union’s livestock committee, and joins re-elected vice-president Martin Kennedy after a three-way election. The unsuccessful candidate was Ian Sands from Balbeggie in Perthshire. Union president Andrew McCornick, from Dumfriesshire, was re-elected unopposed for a second two-year term in office. After the election, Mr McCornick said: “There are difficult and challenging times ahead but Martin, Charlie and I have been given a clear mandate by members to represent them and we are honoured to carry their message forward. 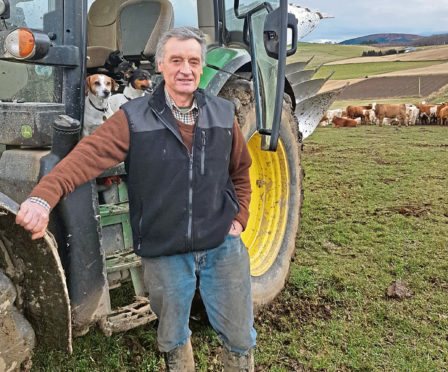 “Throughout the protracted and frustrating Brexit process, NFUS has been crystal clear about its priorities and through our ‘Steps to Change’ work we have mapped out our thoughts on a new agricultural policy for Scotland. “I believe we have a top-table team who, backed by the members, staff and secretaries, have the vision to deliver on that,” added Mr McCornick.